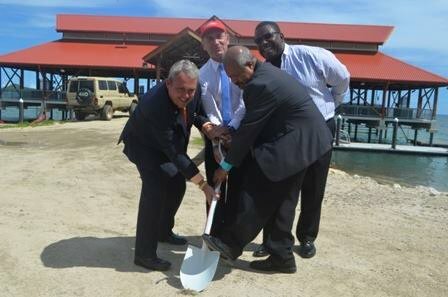 National Capital District Commission and Puma Energy today signed an agreement and officially conducted the ground breaking ceremony for the new Carpark area for the Koki Fish Market under a public-private partnership welcoming a long term community based project that will greatly benefit the people of Moresby South Electorate, especially the fishermen and fish sellers. The agreement sees Puma Energy contributing an amount of K1.5million while the rest is from NCDC that will see Puma take on the job of constructing the new carpark that will include fencing, stonewalls, toilets and other public facilties. “For Puma Energy is not only about investing but it’s all about giving back to the community and seeing the long term benefits of this project that the people will enjoy for years makes as very proud to be part of this partnership,” says Puma Energy Country General Manager, Mr Jim Collings.